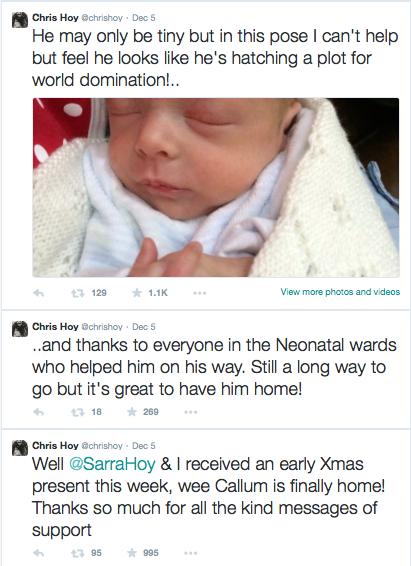 A lovely story in this weekend’s Scotsman newspaper, Sir Chris Hoy and his wife Sarra celebrating their baby son coming home from hospital. It had all the right elements a nice photo, gratitude from both parents for the care received from hospital staff, and thanks to all well wishers. 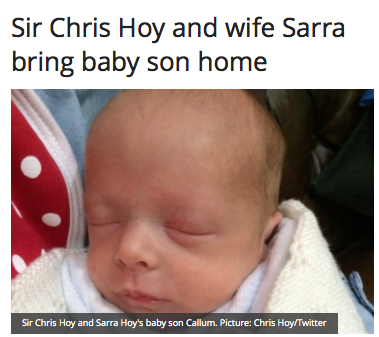 Interestingly, the story was entirely written from tweets sent by Chris and his wife Sarra, with the photo also coming from Chris’s Twitter account. Nothing controversial and I’m sure the Hoys were really pleased it was covered and included all the things they wanted to say. It is a nice example of how providing good content on social media can generate a much wider audience for your news. Making it easy for time-poor journalists with pages to fill is a good way to get your news shared. The Scotsman probably keep a very close eye on Chris Hoy’s Twitter account but you can always name check news outlets or journalists in your tweets to draw attention to a story you’d like covering. This was essentially a press release split into three tweets. Don’t forget this can also work the other way and journalists can just as easily take bad news, critical tweets, and controversial comments from accounts of staff or members of the public and do exactly the same thing. So make sure you are monitoring and engaging in comments about your organisation, tweeting about the good stuff and responding to anything that needs an answer; you could not only reach thousands or even millions of tweeters but newspaper readers too.